Water fountains have created joy in public spaces for centuries. It's entirely possible to have the beauty of moving water in the home garden as well. In a traditional fountain, water issues from a source, fills a basin, and drains away. The water may be no more than a trickle. Fountains can be embedded in a wall, or they can be free-standing. The water might flow over varied surfaces and basins could be arranged so that the water overflows from one into another. The fountain might include sculpture and an ornamental pool. If there is enough pressure, fountains often include a jet, which forces the water into the air. The earliest fountains depended on the natural gravity flow of water, usually from a supplied by a physically elevated source such as a spring or aqueduct. Paintings in ancient Egyptians tombs depict garden fountains in courtyards. Geometrically regularized springs were a common form of water fountain that developed in classic Persian gardens. The Romans often marked the delivery end of aqueducts with a public fountain. The practice lapsed during the middle ages and was revived in the 15th century. Later, the now-familiar fusion of water, sculpture, and architecture marked public water fountains. Trough fountains are found in traditional cultures around the world. It's easy to create this kind of fountain in your garden! A hidden hose fed into the spout of your choice will allow water to trickle gently into a trough below, so that you can enjoy the soothing sound of moving water in your garden.Animated water fountains push jets of water into the air, which then fall back to a basin below. 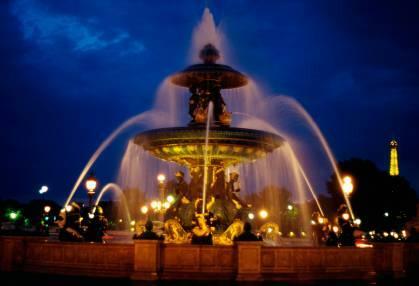 On a large scale, these fountains may be enhanced by colored lights and music to delight the public. They can be reproduced in the home garden with the use of a submersible electric pump to create a recirculating water system. All kinds of objects, including garden statues, can be adapted to function as water fountains. Consider placement of your landscape lighting and use of a portable CD player if you want special effects. Splash fountains, sometimes called bathing fountains or "spraygrounds", have begun to be popular in public areas. Children - and many adults - have always cooled off in public water fountains, and now fountains are being specially designed for this purpose. Water quality is a concern, since disease is easily passed by contaminated water. Nonskid surfaces are important. Often, these fountains are designed to have no standing water at all, so that lifeguards are not required. A lawn sprinkler and appropriate surfaces can create a sprayground for your family's enjoyment in your home garden. Where do you sit when you're in your garden? Having the fountain nearby will let you enjoy the sound of water as you relax. Fountains, even more than other garden decorations, draw the attention of visitors. Consider the visual impact of the fountain as part of your overall landscape design. Can you see the fountain from inside your house? You'll get more enjoyment if you can catch glimpses of it as you go about your daily routine. Is the fountain beneath trees or large shrubs? If so, you will have to clean out dropped leaves, seeds, and twigs on a regular basis. Will water overflow from your fountain into the garden? If so, you should provide adequate drainage or landscape with plants that thrive in wet ground. Most large garden centers and home improvement stores have small fountains that can easily be installed by the homeowner. These systems usually include piping, a pump, a filter, a power supply, and of course the fountain itself. Follow all the directions carefully when installing the system. If anything is unclear, ask directions before proceeding! Be especially careful in working with the power source. Many fountain pumps and filters are powered by a solar panel, which is low maintenance and quite safe. If your pump is electrically powered, you may need to install a low-voltage electrical circuit or a ground fault circuit interrupter outlet for greater safety.